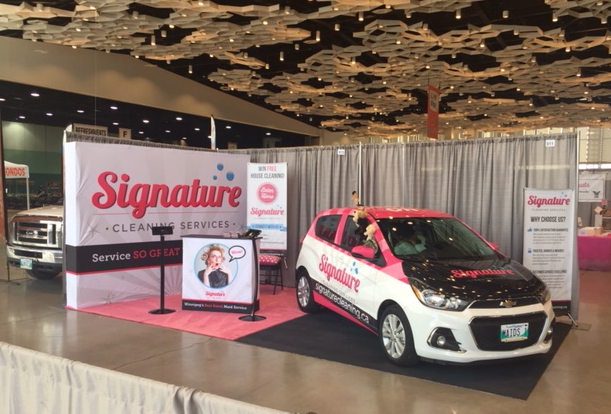 Signature Cleaning Services was so happy to be an exhibitor at the 2017 Winnipeg Pet Show. It certainly was hard to work when there were so many cute pups around. Thank you so much Winnipeg Pet Lovers for visiting our booth and chatting with us about having pet friendly cleaners in your home. Question: Is it a problem if my pets are loose in the house? Answer: We have Pet Friendly Cleaners, so unless you expect your pet to be aggressive, our team has no problem with loose animals in the house. It just usually means we have to hide our dusters! We had a FREE CLEAN GIVEAWAY and Congratulate our winner: Loretta Martin!